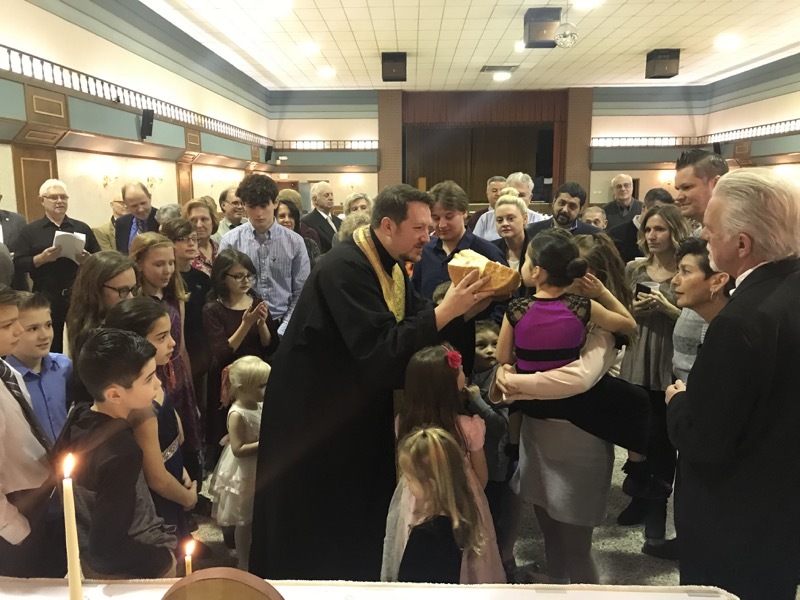 On January 28th, the parish community of St. George in North Canton, Ohio enjoyed their annual St. Sava celebration. The day began with Divine Liturgy, which featured a full contingent of altar servers. The Resurrectional Troparion of the day was sung by Sophia Pavichevich, age 10, a member of the St. George Middle School class. New members of the Parish Council were sworn in following Divine Liturgy as Father Aleksa thanked the outgoing Council on their dedicated service during the 2017 calendar year. Following Divine Liturgy, the children, surrounded by their parish community, joined Fr. Aleksa in turning the Slavski kolac. The families were then seated for a magnificent feast, sponsored by the Circle of Serbian Sisters. Co-President Kathy Tobias thanked everyone for their attendance and noted that donations made during the day would help fund a scholarship for students and young adults that would like to travel to Serbia with their church community during the parish’s upcoming 2018 pilgrimage. Near the end of the meal, the students began their St. Sava program. Father Aleksa emceed the event, which began with one of the youngest church school members, Oliver Sherer, leading everyone in the Lord’s Prayer. Oliver’s prayer was clear and true, and to the delight of the audience he intoned “For Thine is the Kingdom the Power and the glory of the Father and the Son and the Holy Spirit, now and forever. Amen” imitating what he hears in church each Sunday. The program began with two of our older students, Luka and Milan Kraguljac, reading poems in honor St. Sava. The Preschool class, ages 4 to 6, then offered their performance - they showed the audience how to make the sign of the cross, performed a children’s rhyme “Eci peci pec”, and danced “Niska Banja.” The hard-work and dedication of the preschool teaching team, Marina Quinn and Sally Hein, was evident in their well-prepared students! 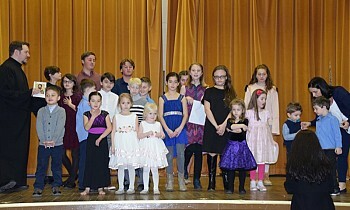 The next class to perform was the primary school group, taught by Svetlana McCully. Each student recited a Serbian or English poem about St. Sava. The middle school group, taught by Rajko Radonjic, followed with a performance of the “Song of St. Sava”. Interspersed with the poems and educational performances, a variety of students showcased their tremendous talent. The performances included a choreographed dance routine, trumpet, illusion, harp, violin, gymnastics, piano, and more. The program ended with our students leading the community in singing the “Hymn of St. Sava”, and then dancing a kolo that started with the students but soon grew to circle the entire Event Center. It was a joyous day for all in attendance!